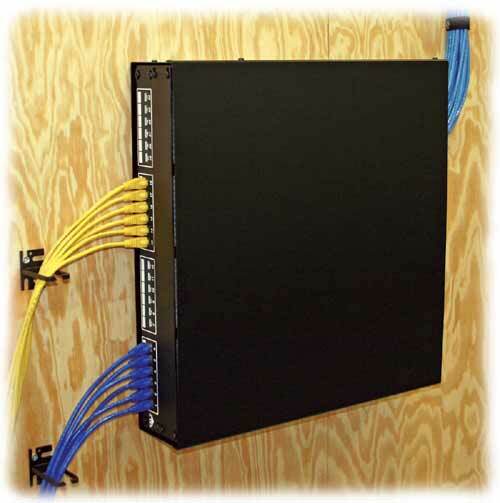 Walit Box is a space-saving wall-mount case designed for mounting 19-inch rack-mount communication equipment flush to the wall, either horizontally or vertically. Available at either 2U or 4U models, Walit Box is ideal for mounting and securing patch-panels, routers, Ethernet switches, hubs or other network appliances mounted flush to the wall, thus occupying minimal space. With 19-inch EIA-compliant #10-32 tapped mounting rails, mounted equipment can be recessed into the case for additional cable protection. Walit Box open back features five (5) slots for (optional) RackiTies that can accommodate meticulous cable management, while offering easy cable-access to mounted network appliances. A removable cover provides for excellent access to installed equipment and connected wires, while vented sides and an open back assure good heat dissipation. Wall-mounting holes on the back of Walit Box provide for left, right, or vertical equipment orientation. 1/4" mounting hardware recommended (not provided).